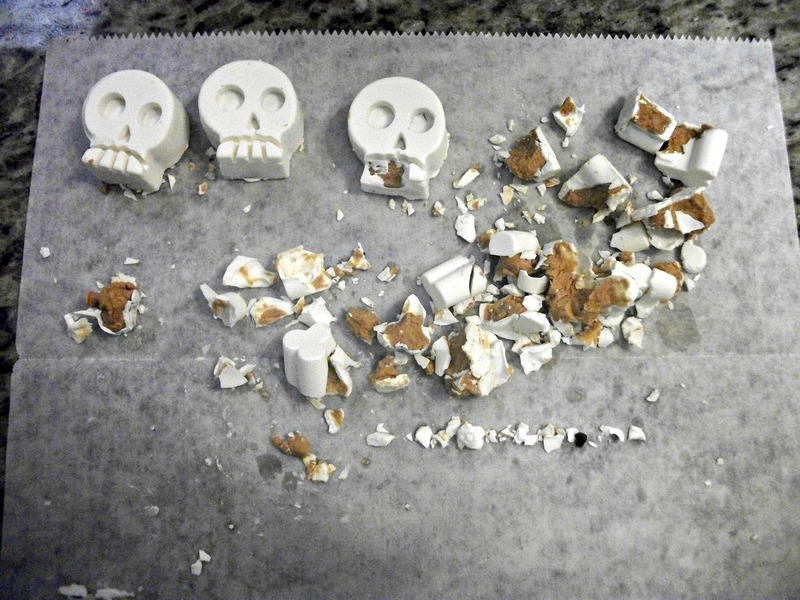 At least I got two skulls to come out perfectly, but the rest? Disaster! So, after that discouraging exercise, I changed gears and decided to forget the silicone molds and make the truffles into pops. 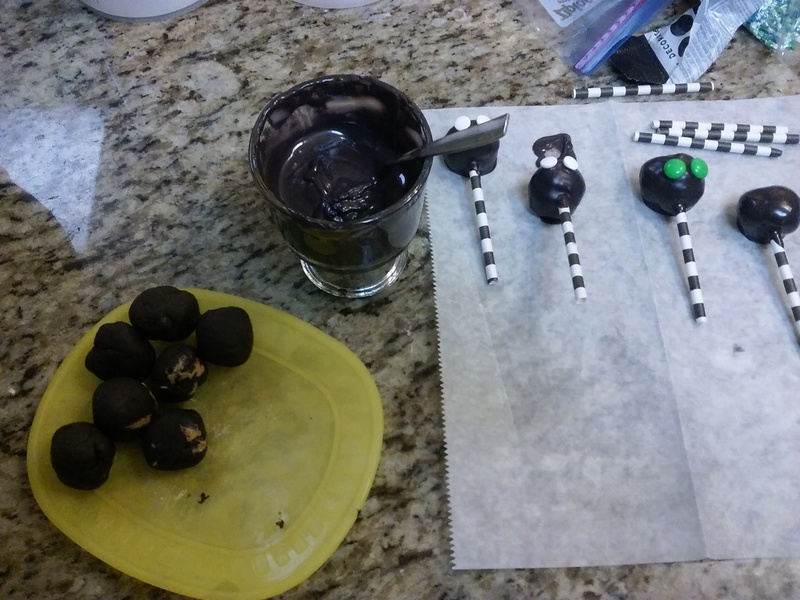 For my oreo truffles, I was originally going to make cats. 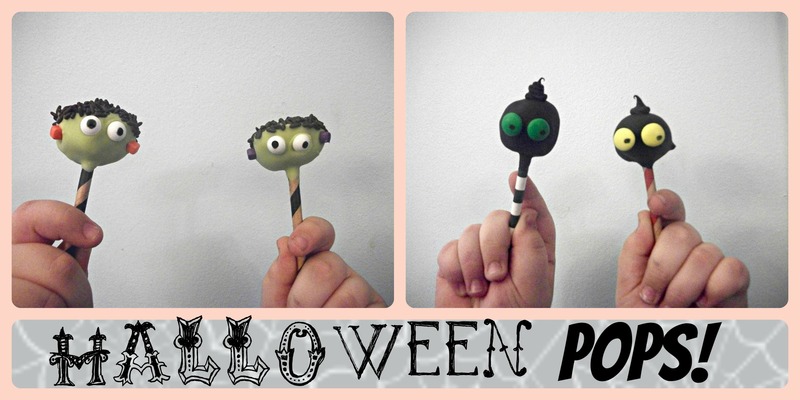 Unless you are Bakerella, getting perfect pops is HARD!!! It is nearly impossible to get them perfectly round, and just as hard to get them coated perfectly smoothly. That being the case, pick a design that doesn’t require perfection. After lots of trial and error, I have found that simple is best. 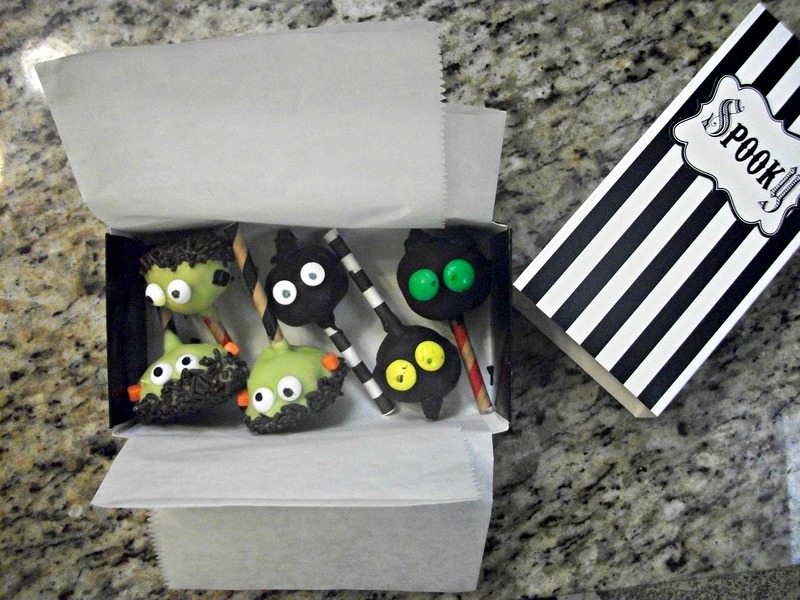 These oreo truffle pops are simply covered in black chocolate with two M&M’s for eyes. After they dried, I used an edible marker to make the pupils. 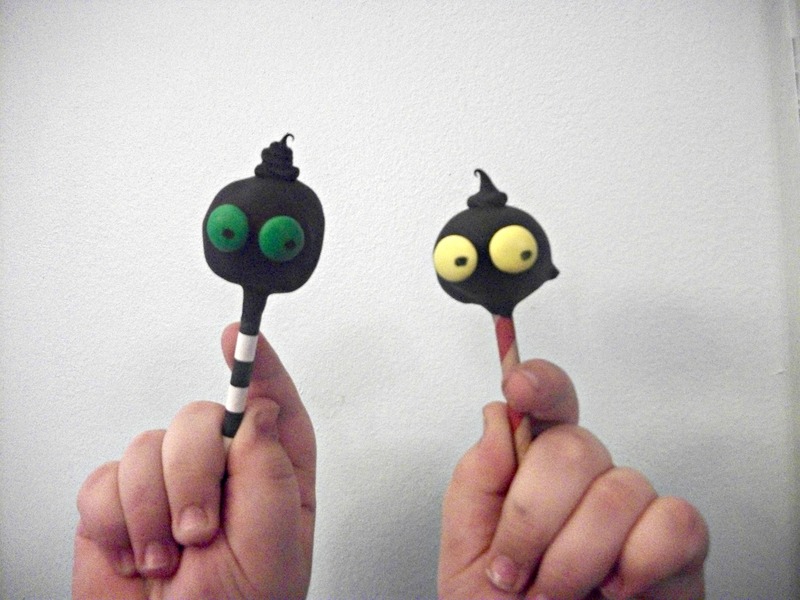 Then I piped a little thingy on top to give them a spooky look. 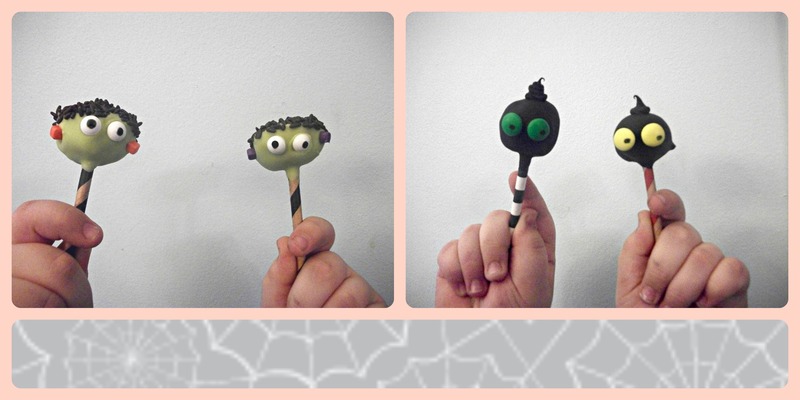 These Frankenstein pops are great for when your pops are not perfectly round, because you can use any flat spots as the top of the head! Since I used Cookie Butter truffles for these pops, they were a little softer to work with than the oreo pops, and they were harder to keep perfectly shaped. After dipping in chocolate, press the top in chocolate jimmies, then use square sprinkles for the bolts and pre made eye candies for the eyes. Paper straws work great for the stick and are way more fun than plain sticks. If you are using Wilton brand melting chocolates, you WILL need to thin the chocolate out or it will not be thin enough to coat. You can do this by adding shortening to your melted chocolates or by adding special thinning crystals that they sell, such as these. I just use shortening. Pops are so much easier to make if the centers are frozen. Prepare them at least a day ahead of time and freeze them. Only take a few out of the freezer at a time as you make them, keeping the rest in the freezer so that they don’t thaw. It can be discouraging to have an idea of what you want to create in your head, and then it doesn’t work in real life. Instead of getting frustrated, embrace what does look good and go with that. Being flexible is important to enjoying this process. 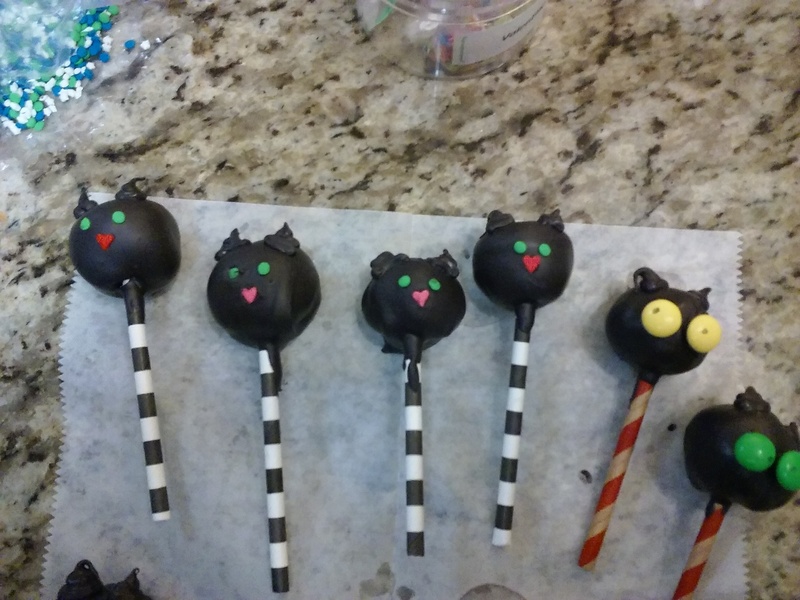 My original plan was to make black cats…. Yeah. After I saw that the cats weren’t going to work, I tried to figure out what would work. I hope that these tips inspire you to try some pops of your own. They are so fun when they turn out!